Born wild, Cobra the Mustang is now turning heads and winning ribbons in traditional and western dressage. Any breed of horse can compete in dressage, but as you look further up the levels, the competitive field becomes a bit less diverse. Tall, muscular European warmbloods dominate the upper levels as they have been bred for generations to do. Cobra is an American Mustang, selectively bred by nature for traits that optimize survival in the wild. 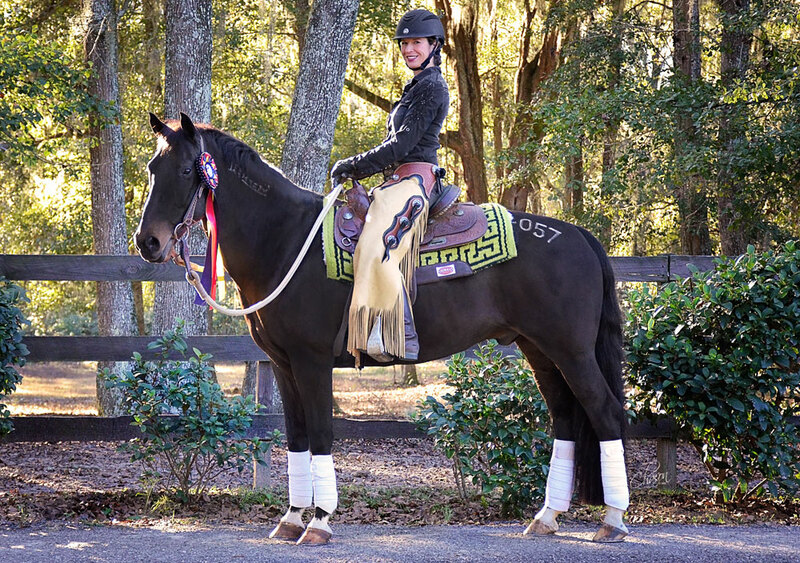 In spite of that inauspicious start to life, the now 10-year-old gelding has been a serious contender in both the traditional and western dressage arenas, competing—and winning—against those purpose-bred warmbloods. 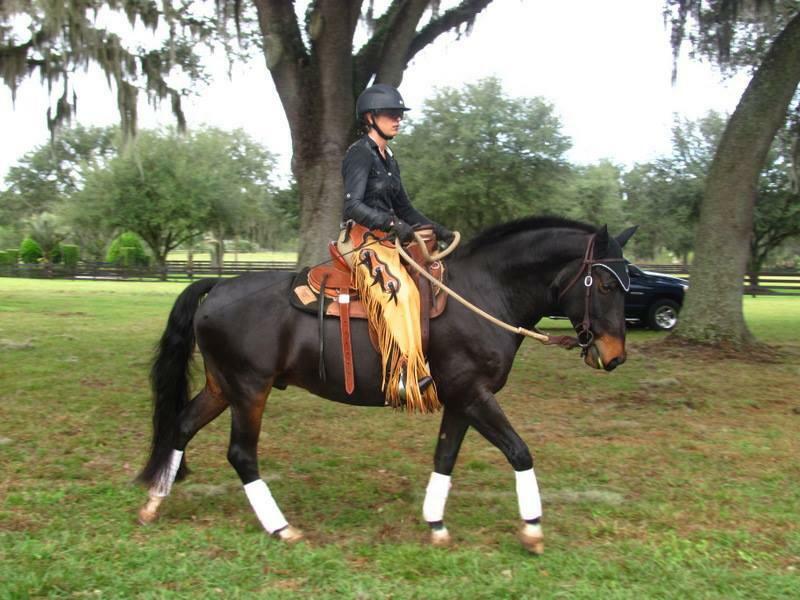 His owner/trainer, Marsha Hartford-Sapp, describes how her relationship with Cobra began. The Extreme Mustang Makeover is an initiative of the BLM’s Wild Horse and Burro Program and the Mustang Heritage Foundation. In these events, trainers are paired up with a wild horse that they then train for 100 days. At the end of that period, the trainers show off what they’ve accomplished with their horses at a competition. In 2010, participants in the Makeover selected their horses from a herd of what are known as “three strikes” horses. These Mustangs had been through public sales and passed over for adoption three times. The trainers in that year’s event would be tasked with showing off what a so-called “unadoptable” horse can do. Mustangs have a loyal following in certain segments of the horse world, particularly in working western and trail riding circles, but Hartford-Sapp, whose business is centered on hunter/jumper and dressage training, had something else in mind when considering a horse for her Mustang Makeover project. Cobra fit the bill conformationally, and his good looks didn’t hurt, either. With his dark bay coloring and four socks that accentuated his movement, he had a sport-horse look that stood out from the others in the herd. Hartford-Sapp didn’t have an agenda for Cobra’s training following the Makeover, but it wasn’t long before his talent for dressage emerged. Cobra’s record in the traditional dressage arena is remarkable for any horse, and more so for one who was completely wild for the first six years of his life. 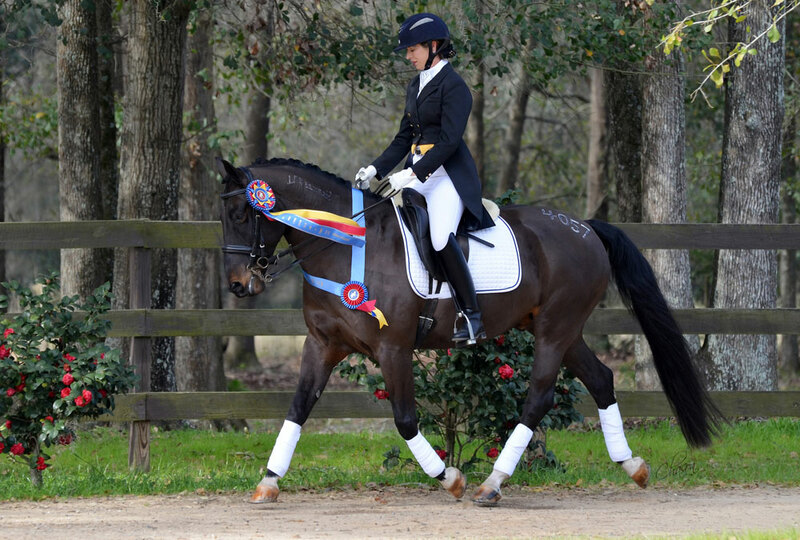 Together, Marsha and Cobra competed at First, Second and Third level and obtained all of the scores needed for Marsha to earn a United States Dressage Federation [USDF] Bronze Medal within a five-month period. In his first year showing, Cobra earned the Adequan/USDF All-Breed Award Reserve Champion title for First Level. The following year, he earned the All-Breed champion title for Third Level and the year after that, 2015, he won the title for Prix St. Georges. Also in 2015, Hartford-Sapp earned her USDF silver medal with Cobra. A silver medal requires riders to earn two scores above 60 percent from two different judges at both fourth level and Prix St. Georges and is a notable accomplishment for any rider on any horse. To earn this award with a Mustang who had been completely wild until five years earlier was an exceptional achievement. But Cobra and Hartford-Sapp found more challenges to take on. “I started to pay attention to western dressage when it became a United States Equestrian Federation [USEF]-recognized sport three years ago,” says Hartford-Sapp. “I found it interesting because I do have a western background and I wanted to find something my Mustangs could do. 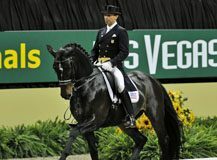 The western dressage tests used in USEF competition are based in the same fundamentals as traditional dressage, but designed for the working western horse. Western Dressage is a new sport, and its popularity is growing rapidly among riders from a variety of backgrounds. Marsha reports that the sport’s diverse following was on display at this year’s Western Dressage Association of America (WDAA) World Championship Show in Tulsa, Oklahoma. “There were 600 entries ranging from Amateur Intro to Open Level 3, which is the highest level offered right now,” says Hartford-Sapp. “Some of the classes were over 40 entries deep. Nevertheless, the Mustang’s training worked for him and he left the show as a WDAA champion. Cobra is the 2015 World Champion in the Level 1 Musical Freestyle and Reserve World Champion for Level 1, Test 1. He is also on track to receive the USEF Western Dressage Horse of the Year award for 2015, the inaugural year for the award in this discipline. But there’s still plenty left for Cobra and Marsha to achieve together. When asked if there’s anything else she wants people to know about her horse and her sport, Hartford-Sapp doesn’t hesitate. Find out more about the WDAA at westerndressageassociation.org. 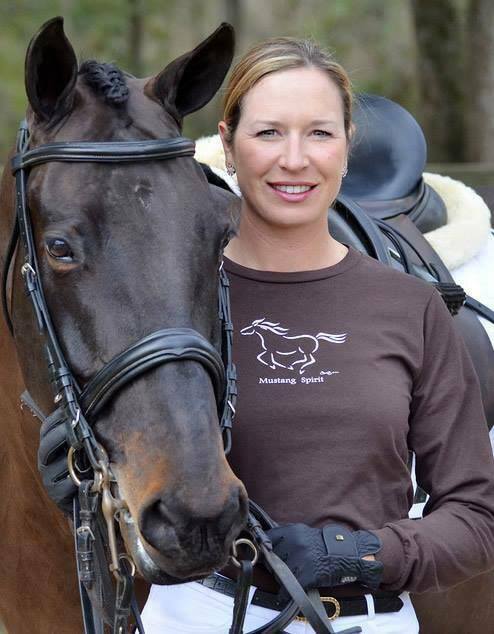 Find out more about Marsha Hartford-Sapp and her horses at www.southernoaksequestrian.com. He looks very much like the baroque horses from which he descended. Nature is a good arbiter of what works for survival. She has done a remarkable job of developing his trust and bonding instinct. He has found her to be a safe “protector”. Does anyone know the title of the song in the video? Very inspiring article. I’m making plans for my next horse and this piece has clenched my decision. (But p.s. he’s a Brown not Bay). ?? Chalk one up for the great breed of Mustangs!! What away to promote Mustangs. Beautiful and what great training.